Night time light pollution is rapidly increasing across the world. Nocturnal animals are likely to be especially affected but how they respond to artificial light is still largely unknown. In a new study, scientists from the Leibniz Institute for Zoo and Wildlife Research (Leibniz-IZW) in Berlin, Germany, tested the response of European bats to red and white light sources during their seasonal migration. Soprano pipistrelles (Pipistrellus pygmaeus) and, to a lesser degree, Nathusius’ pipistrelles (Pipistrellus nathusii) were recorded more frequently near red LED light, indicating that the animals might be attracted to red light during their migration. In contrast, the scientists did not observe such behaviour near white LED lights. The wavelength of the experimental red LED lights was similar to that of red safety lights used for indicating the presence of wind turbines or tall buildings to aircraft pilots. Warning lights such as these might therefore lure migrating bats precisely towards the danger which the lights help people to avoid. Switching to more bat friendly lights or deploying on-demand lighting – which only turns on if an airplane approaches – would most likely reduce bat collisions and bat casualties at wind power stations. The study has just been published in the scientific journal Ecology and Evolution. Each year, light pollution increases by around six per cent worldwide. In particular, energy efficient and cheap LEDs are more and more used. Light is an important cue for orientation used by many animals, and also influences their diurnal rhythms and behaviour. It is well established that bats are sensitive to light while hunting at night. While some species are attracted to artificial light sources because of the insects nearby, most bat species generally avoid artificial light. Most previous studies examined the response of bats to artificial light during non-migratory periods. It is already well-known that artificial light causes disorientation in birds that migrate at night. Does the same apply to bats? Many bat species also travel for several hundred or even thousand kilometres during their annual migration, yet we know virtually nothing about their response to artificial light. During late summer, thousands of bats migrate along the coastline of the Baltic Sea in Latvia, through Pape Nature Reserve. Nights are starlit and largely devoid of light pollution as there are only a few human settlements in the area. Here, the scientists installed an eight metre high pole near the shoreline. A plastic board fixed to the pole was lit-up in 10-minute intervals alternating with darkness. The LED lights illuminating the board switched between red or white LED light. By using ultrasonic microphones the scientists recorded the echolocation calls of bats coming close in order to identify both the species and the number of bats passing by the unlit or lit experimental site. Soprano pipistrelles (Pipistrellus pygmaeus) and, to a lesser degree, Nathusius’ pipistrelles (Pipistrellus nathusii) were recorded more frequently at the experimental site during the red light phase than during darkness. However, bats did not use the artificial light to hunt insects, since the number of hunting echolocation calls remained approximately constant during the light-on periods. 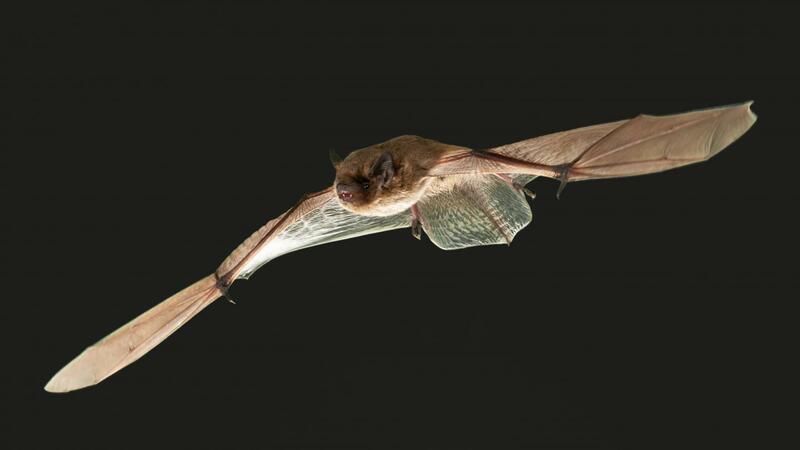 “We assume that bats forage for insects early in the night before they continue with their long-distance flight,” explains Christian Voigt, lead author of the study. “Also, insects are generally more attracted to short-wave light – such as ultraviolet light – than to long-wave red light. Therefore, the displayed light was not attractive for insects.” During the white illumination phases, no increase in the number of bats passing the board was observed.